There are lots of glossy photos of amazing gardens out there, and sometimes they seem too good to be true. I thought this was an interesting question and it cuts to the heart of what can be a problem in the gardening world – putting forth the impression that our gardens are perfect. As a garden educator, writer, and speaker, I can be guilty of this myself. It’s way more fun to share the most beautiful photos of my garden and talk about the success I’m having each season. But, that’s not always the most helpful story to share. Because, even if you’re a very experienced gardener, you still make garden mistakes and have total failures each season. 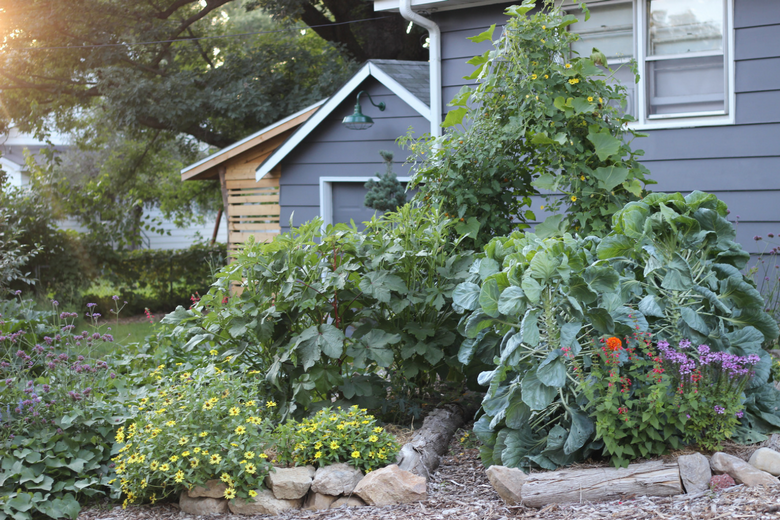 And since The Creative Vegetable Gardener is run by a real person with an actual yard, I think it’s just as important for me to share what’s not going well in my garden so you know that I’m far from a perfect gardener. There are plenty of times each season when I ask myself, “Why did I do that? I should know better.” and pledge to do better next season. So, in an effort to be more transparent and show the not so glossy side of vegetable gardening, here are my disappointing garden mistakes of this season. I’ve been having tons of fun pushing the limits of the growing season here in Wisconsin by growing in low tunnels and cold frames. I learned the hard way that they can get really hot underneath the plastic on a cold and sunny later winter day. One day I got home and it was 109 degrees in there! Spring vegetables don’t like hot temperatures so they got stressed out and bolted prematurely. Lesson learned. Next year, I’ll take the plastic off much earlier and replace it with row cover. See that little white-winged lady in the photo above? That’s a cabbage moth. On any given day I have many of these moths swirling around my garden and laying eggs on my brassica plants. This past season, they destroyed my entire lacinato kale crop. Luckily, they don’t seem to bother the curly varieties, so I have still had plenty of usable kale. But, there are so many that it’s not practical to pick them off by hand after a few months. Next year I may experiment with keeping some kale under row cover for the entire season. (Read more about them here). One of my favorite flowers for the vegetable garden is verbena bonariensis, a tall and airy purple verbena that mixes perfectly with vegetables. I haven’t had much luck growing it from seed at home, so I usually buy plants from a local nursery. I was so disappointed this year when the plants I bought turned out not to be true to that variety. They had very little color, like in the photo above, when they’re usually bright purple, like the photo below. I’ve pulled most of the ugly ones out so they don’t reseed themselves next year. I may try starting my own seeds again, or buying plants from a better source. Ever since I built my current vegetable garden I’ve struggled with soil health issues. You can see in the photo below that my beans turned yellow right when they started producing fruit. This is a clear signal that they aren’t getting the nutrients they need to thrive in my garden. I’ve gotten several soil tests done and now mix soil amendments into my garden before planting, but sometimes the vegetable plants are still unhappy. I spread an extra layer of fertilizer around the plants and they bounced back, but they never were as healthy as a second planting I sowed in another bed. I’m learning that building the fertility of my garden soil is a longer term project than I first anticipated. I’ll reassess next spring with a new soil test and continue mixing and adding amendments based on those results. My tomatoes were almost a complete bust. The plants looked healthy enough, but they didn’t get that tall and I didn’t harvest nearly the amount of tomatoes I was expecting. For our yearly salsa making, I had to go out and buy tomatoes. The plants that produced the best were the Red Zebras that I’m harvesting in the photo below. My husband commented that they don’t even taste that good – which was true. Next year I’ll plant them in a different location, work on soil fertility, and prune them well for air flow. I was really happy with the DIY livestock panel trellises I built for my side yard garden. But, in my enthusiasm, I completely over planted both of them. The curved one was taken over by Love Vine, which was a big disappointment in the flower department. It bloomed very late and they were difficult to see from a distance. If I’m going to give up valuable space for a flower it better be showy! On the second trellis, I planted cherry tomatoes, cucumbers, winter squash, and pole beans. They shaded each other out most of the time, although I think the cucumbers really liked it because the plants are super healthy and still producing fruit! I need to restrain myself next year and only plant a few seeds and seedlings on each trellis. Luckily, one of the gifts of gardening is that it’s cyclical. In Wisconsin where I live it, comes to a complete stop (for a long time!) and then we get to begin fresh the next spring. The slate is wiped clean and each new season is a blank canvas filled with all of our gardening aspirations. The end of the gardening season is a great time of year to reflect on what didn’t go so well, so that next year we can address those things and try to improve our gardens bit by bit. Before the season fades away into your memory, take a few moments to jot down some notes about what you want to do differently next year. Your notes will serve as a gentle reminder to your enthusiastic spring self of what new things to experiment with and what to leave behind next season. I’d love to hear what lessons you’ve learned from this season and what you’re going to do differently. Share in the comments below! I have been gardening one year. My garden is 20 years old and we bought it (cottage with garden) one year ago. Now I tell chainsaw gloves, pruning shears and feral rose plant. Those two first I have noticed quite nice gardening friends. Under feral rose plant appeared red currant plant. Luckily we didn’t cut off plant with chaishaw, like thought before.